When you play this personnel, you may draw three cards and discard two cards from hand. "We have a saying in our line of work: 'There's no time like the past.'" 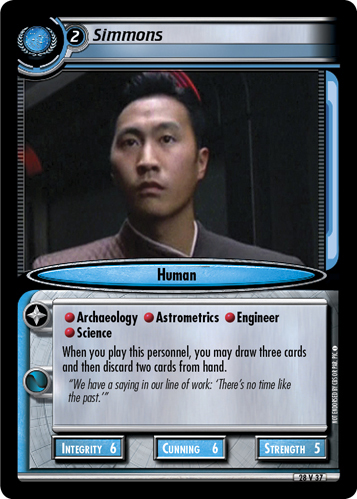 Characteristics: affiliation, discard a card from hand, additional card draws, Future related, Human species. Card logging info: First edited by Roga Danar at Feb 24th, 2013. Please support openCards and validate game text of this card!